2017 is going to be the year when everything will go viral and social media will become more customer orientated. You must provide value, offer attractive content, share videos, live stream, and even provide Virtual Reality experiences. Videos and live streaming will dominate Social Media in 2017. Analyse your own social media accounts and you will see that this is very predictable. If you post a video on Facebook, your reach will be significantly higher than just a blog post or even a photo. Same thing happens with all the other social media platforms. Life-streaming is growing in popularity, majority social media platforms adding this feature in 2016. I personally think Facebook Live will dominate the market in 2017, especially for business, despite the fact the other social networks already introduced or will introduced this feature. All social networks have grown in 2016 and billions of videos have been shared. The forecast is astonishing. 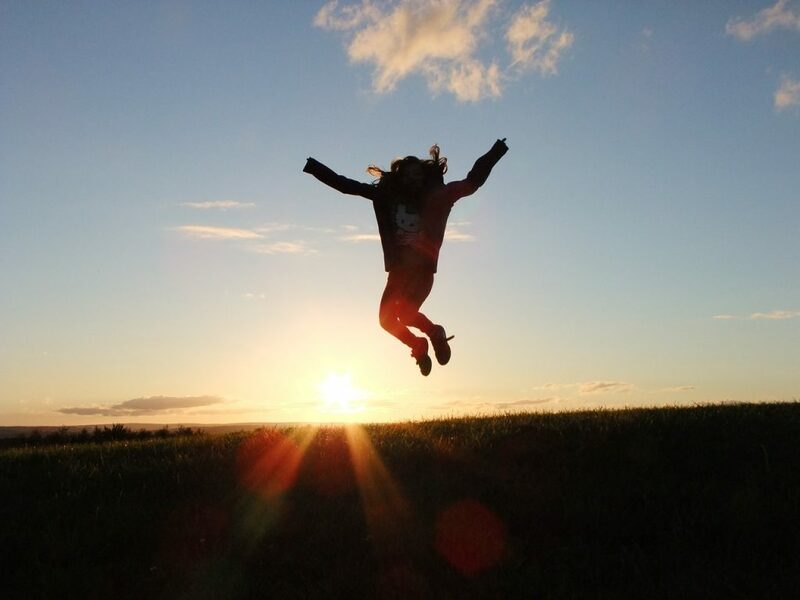 By 2019, 80 percent of global Internet consumption will be video content, according to CISCO. Here are some of the statistics I found regarding the videos shared on social media in 2016. If we look at the number of daily video views, Snapchat and Facebook are the leaders. 300 hours of video are uploaded to Youtube every minute and there are 3.25 billion hours of video watched each month, according to Brandwatch. Virtual Reality is going to be the next big deal in 2017, since more and more people are becoming interested in experiencing VR. Here are some VR market size projections from Statista for the next three years. Virtual Reality Active Users will grow to 90 million of people in 2017 and 171 million of people in 2018, from 43 million in 2016 and only 6.7 million in 2015. More and more companies will develop new VR headsets and software. The VR market is set to grow at a very fast rate in the following years, with revenues from virtual reality software alone forecast to reach an over three thousand percent increase in four years. 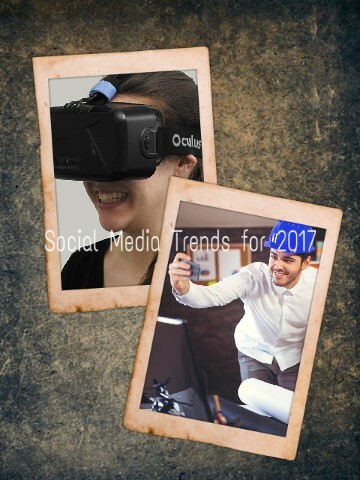 In my book Social Media Trends for 2017: 25 Influencers and Social Media Experts from UK, USA, and Australia Shared Their Predictions, published on Amazon, Sam Hurley, Social Media Influencer, owner of Optim-Eyez, predicted that “more brands will begin to adopt these technologies in 2017. Over the next 5 years, I predict a large shift in uptake”. 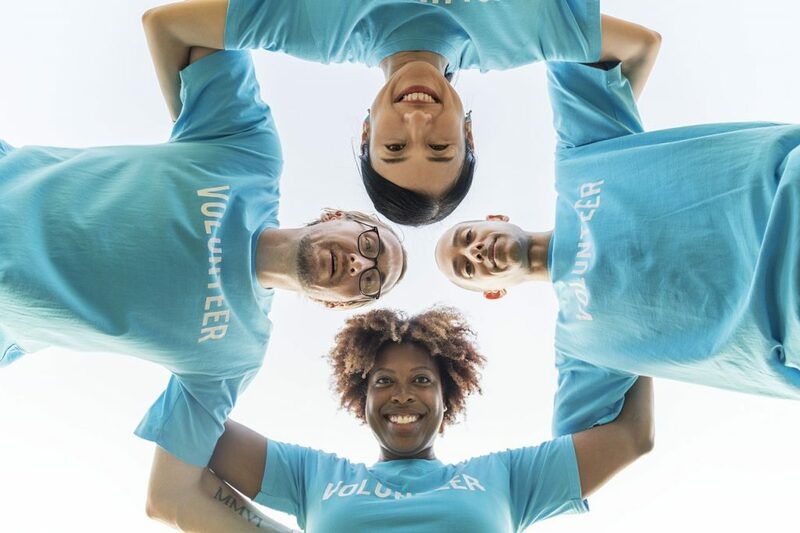 Jessica Moreno, Social Media and Brand Account Manager for Active Web Group, explains how this will work: “Virtual Reality is giving companies mounds of opportunities when it comes to marketing and promotions. Allowing users to experience products will be the future of advertising as the prospect of selling can evolve completely when people can literally see themselves using a new product or service”. VR is already applied successfully in the housing market driving sales considerably, and will soon be used by Carnival to allow potential customers worldwide to experience a virtual cruise. Facebook will be, again, the leader in introducing social media in virtual reality – the company started to invest in VR and they will continue doing this in the next few years. According to Bloomberg, Facebook wants to own VR the way Apple and Google own mobile. That means taking control of the technology, from the software to the hardware. Facebook acquired Oculus VR, the leader in virtual reality technology, in March 2014 and the Oculus Rift went on sale two years later, in 2016. They invested in new technologies, and here is a virtual reality demo that Mark Zuckerberg, Facebook’s CEO, did live on stage at Oculus Connect in July 2016. Until now VR made us feel somewhere else, in a virtual world, but the next level of VR will encourage socialising. On 15th December 2016 Oculus launched Oculus Rooms and Parties for Gear VR, a new feature that will allow you to actually hang out with your friends in Virtual Reality. These exciting new features are now available on Gear VR and will come to Rift in 2017. Finding your friends in VR is going to be very easy. You will just link your Facebook and Oculus accounts or search for people by their real name or Oculus username. Once you connect and become Oculus friends, you can see when your friends are online, start a voice call, or jump into an experience together. You will be able to experience Oculus Rooms, a private virtual space to spend time with friends in VR. What Oculus wants is to enable social activities that mirror how you hang out with friends in real life. Facebook has also partnered with Samsung to bring the Facebook’s popular live-streaming functionality to the Samsung Gear VR headset. Google is one of the major players when it comes to Virtual Reality and their latest product says it all. Daydream, Google’s latest VR headset, was launched in October and is now available on Google Store. The soft, lightweight headset keeps you comfortable and the simple, smart controller puts you in control of the action. The only problem with this headset is that is compatible only with Google’s phone Pixel. I know there are many other VR headsets on the market, at various prices, but these two are the most advanced who will dominate the market significantly. 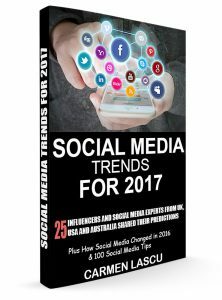 If you want to find out more about Social Media Trends for 2017, How Social Media Changed in 2016, as well as useful Social Media Tips (100 to be precisely) and How to Create a Social Media Strategy, read my latest book available on my online shop (pdf format) and on Amazon (Kindle and Paperback).